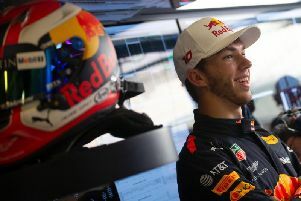 Max Verstappen took third spot in the 2018 F1 finale in Abu Dhabi on Sunday, one place ahead of his Renault-bound team-mate Daniel Ricciardo, who leaves Red Bull Racing after five seasons. The Australian threatened to be a part of the podium battle after he ran long in his first stint, emerging from the pits in fifth with fresh rubber. But despite passing an ailing Valtteri Bottas for fourth, he never had the pace to catch Verstappen who had claimed third spot - his fifth consecutive podium finish. The Dutchman's result, combined with a retirement for Kimi Raikkonen, meant he took third spot in the championship. Ricciardo ended his relationship with Red Bull Racing after five seasons, and two previously with Toro Rosso, having amassed seven wins and 29 podiums. “I would have loved to sign-off this chapter with a podium, so I can’t be ecstatic with fourth and there is a little disappointment there," he said afterwards. "I led for a while which was fun but staying out put me out of touch with the leaders. I don’t think we had much of a choice, maybe we could have pitted early and kept track position but nobody thought the supersofts would hold on like they did. "I would have loved a championship with them but Red Bull brought me my first pole, victory and podium. Everything I have done in F1 is down the them and I’m incredibly grateful for that. The moment before the race with everyone in the garage showing their love and appreciation was really cool and that’s certainly something I will never forget. Verstappen recovered from a poor start in Abu Dhabi, where he was running as low as eighth in the opening stages. He came up against Esteban Ocon - his Brazilian GP foe - before dispatching the Force India man en route to third place. He said: "It wasn’t easy from the start, the engine had a bit of an issue which meant we lost a few places in the opening lap. It was a good launch but then I think it went into some sort of protection mode, we switched a sensor off and it seemed to be ok for the rest of the race. "Once we had sorted the problem I was able to get on the attack and enjoy some really nice overtaking, especially passing Bottas.